· You must choose an appropriate place: clean, quiet and safe to set up an altar where you can sit undisturbed throughout the spell casting ceremony. And that the place should be suitable for you to burn oil lamps and burn incense. · You need to choose good timing: for good spells the time is during White Month. · You should choose an appropriate ‘asana’ or sitting position; traditionally, the lotus posture is the best; but you may sit in any posture but remember to keep your back straight. o For peaceful spells one should face either facing north or east. o For enchantment spells one should face south. o For killing/overpowering spells one should face west. · You will need a japa mala. However, you should not use the right index finger to turn the mala and that the mother bead should never be crossed after one round of recitation. It is best to cover the mala with a piece of cloth during mantra recitation. When not in used, the mala should be wrapped in a piece of clean cloth. · For a mantra to take effect, the required number of recitations would be 10 million times. · You should consume only vegetarian food. And also beware of not eating too much or too less during the spell casting time. · So far as permissible, you should keep silence and avoid talking to a second person unless necessary. · You are also required to keep celibacy throughout the ritual. · You should be sleeping on the floor. · You must have faith in the spell you are casting. · You must also keep your body and mind clean during and after the spell casting period. The above pointers are just general rules for casting White Vedic spells. The rules vary from masters to masters and it is best just to follow what is taught by your own master to avoid confusions. This ritual will help you to awaken your spiritual nature and the three-fold aspects of the divinity slumbering within. It confers upon the user the grace and blessings of the Trimurti Lords: Brahma, Vishnu and Shiva corresponding to the 3 Gems of Buddhism. Chant the mantras as a discipline for accelerating your spiritual development and improving the quality of your life. Chant the first mantra 3000x every day for 7 consecutive days. Then chant the second mantra for the same number of times and the same number of days. Follow this same chanting procedure and discipline with the third and fourth mantras. This whole cycle requires 28 days to complete or one moon-cycle. You may repeat the discipline for as many moon-cycles as you wish. Choose an auspicious day to commence your chanting-discipline. If you are not able to chant all of the mantras in a single moon-cycle you may rest for a few days after every 7-day chanting of one of the mantras and resume when you have gathered sufficient strength. This practice and discipline bestows wonderful benefits that you will gradually discover. There are many systems of predictions that enable us to know our future: Astrology, Palmistry, Divination, Tarot etc. The simplest and most popular amongst of all is the palmistry. There is another method which a person can know the future, which is through the practice of Panchanguli Sadhana. Panch-anguli is the deity of Kaal Gyaan i.e. who can help one know about Time. Through her Sadhana a person could easily foresee future happenings hence mishaps can be avoided. Also it is through Her Sadhana that a person could become expert in Palmistry and a reliable soothsayer. 1. One needs an empowered Panchanguli Yantra and siddhi rosary. 2. It can be tried on the second, fifth, seventh day of a White Month. 3. It must be accomplished between 4 am and 6 am in a quiet place. 4. He/she should be seated on a piece of yellow mat facing East and wear Yellow clothes. 5. The Yantra and picture of Goddess Panchanguli should be placed on a wooden seat covered with yellow clothes. 6. He/she should draw Swastik on Yantra with vermilion. 7. After that, prayers to Lord Ganpati and Guru should be made. 8. Next offer prayers to the Yantra offering sixteen articles - vermilion, sweets, water, flowers, rice grains, sandalwood paste, milk, honey, curd, ghee, cloves, betel nut, betel leaves, sugar, mouli (holy red thread) and Panchamrit (mixture of milk, water, honey, curd and ghee). Panchanguli Mahaadevi Shree Seemaandhar Shaasane. Adhishtthaatri Karasyaasou Shaktih Shree Tridasheshituh. Om Ttham Ttham Ttham Swaahaa. 11. Do this regularly for 7 days consecutively. 12. Chant the Mantra at the same time daily. 13. After completion of the Sadhana throw the Sadhana articles in a river or pond. 14. Follow the following rules during the course of Sadhana. · Maintain celibacy during the Sadhana days. · Have a bath before Sadhana. · Sleep on the floor. · Maintain purity of body and mind. · Avoid talking too much. · Eat only pure food. · Chant the Mantra with full devotion. Do not move or get up during the Mantra chanting. · A ghee lamp should keep burning during the Sadhana. If the Sadhana is tried with full faith and devotion one surely attains to success and one is able to look into anyone's past, present or future. The topic of Great Perfection is a controversial one as one would need to take a completely different view towards how he/she looks at the concept of enlightenment. Some scholar treat Great Perfection has the same root as Zen Buddhism but not less denied this assumption. In fact, I would think that the Great Perfection is not related to Maha Yoga and the Anuttara Yoga as it has a different concept all together. So, what is the ‘state of mind’ refers to? · There is no difference between enlightenment and cycle of rebirth. · There is no difference amongst the Trikaya: Dharmakaya, Sambhogakaya and Nirmanakaya. · When our mind is at peace, it is said to be in Dharmakaya form. · When our mind is in enjoyment, it is said to be in Sambhogakaya form. · When our mind is changing, it is said to be in Nirmanakaya form. · Nirvana (enlightenment) cannot be achieved as our mind changes state constantly. The Theravada Buddhists can meditate for a very long time but when they awake from their meditative state, they shall fall into the cycle of rebirth. So, in Great Perfection View, as long as one keeps the view that there is no difference between Nirvana and cycle of rebirths; then it does not matter where the person is. · Pure land and hell had never existed; it is all in the state of our mind. So Great Perfection in effect, thinks that practices of Maha Yoga and Anuttara Yoga; also the Amitabah pure lands are all never existed. The above theories were made based on no one has returned from enlightenment and preach about it (logically speaking); including the enlightened one! There is no difference between Nirvana and cycles of rebirth. We are dwelling at our unchanged state (of mind). All that is done naturally indeed according our heart. We shall be able to surpass whatever we have proved and determined." Mind blowing as it sounds, perhaps this is the reason why Great Perfection is not taught openly but only to a few qualified disciples. The above view will definitely ruin the core foundation of many Buddhist schools. It is up to individual to choose if he/she want to accept the above points. There are many reasons why a person remains single and unattached to date. In astrology, if the character of a lady is too strong, too dry or she is destined to have no husband; then this lady will remain single. Likewise, if a man has no fortune, then he also would not have a wife in this life. In Feng Shui, if the front door of the house a person dwells in faces flying star 5 and 2, then this person is likely to remain single too as long as he/she stays in this house. In order to end this relationship, a ritual called ‘sending off a kid’ need to be carried out. The ‘kid’ here refers to the person who is still single. In Chinese custom, anyone who is still single is known as a ‘kid’ even he/she is already 100 years old. This ritual is not complicate but it needs to be carried out by a second person who may be the person’s nephew or niece, ideally this person is younger than the bachelor. After an auspicious date is selected, offerings items such as a paper manikin, joss papers and a small paper boat or horse of some sort is burnt at the nearest road junction or river. If the item is carried out correctly, then the bachelor would hear of good news in a relative short time, some say 100 days or so. I supposed, any single and attached persons may try this ritual if he/she has fate in it. After all, it only cost a few dollars if he/she performs this ritual him/herself. 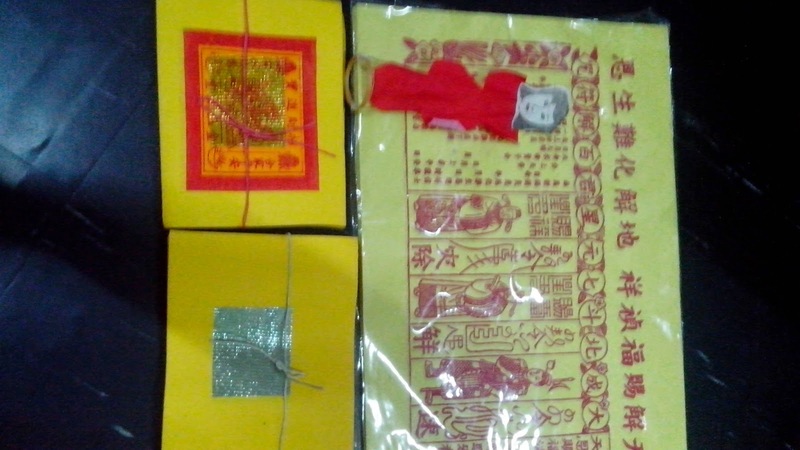 Of course, please don’t forget to give a red packet (money) to the person who is performing the ritual for good omen. Items required: the hundred solutions (biggest piece), the paper manikin, the gold foils and the silver foils. I like to keep a few simple Taoist rituals at hand as they can be very simple and effective way to solve my day to day issues. Have you experience that after you have visited a funeral ceremony, a graveyard or after a night out, you suddenly feel headache, drowsy with light feverish? If you do, then Taoists believe that you may be affected by wandering spirits. There are many ways to go about tackling such a spirit intrusion issue, the below method is my favorite as it has been tried and tested. This method is also good for those having low spirits. This ritual can be done at any time. First, take a piece of ‘hundred solutions, a paper manikin, 3~5 pieces of gold and silver foils each. Now, sweep the papers top down a few times until you feel alright. After you are done, burn the papers outside of your house as offerings to whatever there is to leave in peace. Whatever you do, please don’t burn the paper offerings in your house! You may need to repeat this ritual a few times if the condition is severe. This method is also applicable to light case of mental disorders. In Asia, the above materials can be purchased in Chinese shops selling Taoist artifacts. There are some shops in US and Europe selling similar items too. If you do it right, you can save hundreds of dollars consulting Taoists! Many Asian like to setup altars in or beside their business premises to appease local spirits. Let us first exclude why multinational companies are doing flying colors without the need to offer to spirits; or any other religious reasons. Do you aware that for small medium businesses; what you worship affects the well beings of your household and your businesses? For example, if you are doing a business that serves general public: retail stores, coffee shop, sundry shops, casinos, hotels etc. Then if you worship Tibetan Tantric deities such as Yamantaka, Vajrakilaya, Hayagriva, Kalachakra and etc, then your business would probably not so good. The reason is that the practice of Maha Yoga and Anuttara Yoga are based on the Theory of Emptiness. It is also due to the fact that the energy generated by these tantric deities and related human bone ritual implements wards off potential customers. If you don’t believe me, try to paint the image of a human skull in your hotel or sundry shop; I bet you shall see the number of your customer declines faster than you could imagine. I have some folks came to me complaining of problematic spouse relationships and the loss of old customers to their competitors. After some auditing and questioning, I only found they were practicing Vajrakilaya or the like. In order to understand this scenario, we first need to understand that the mantra of Vajrakilaya means: binding and burning of all demons… And we normally describe some who cannot behave themselves as ‘demonic’ or ‘satanic’; so these folks who chanted Vajrakilaya mantra in his house everyday indirectly means that these people are ‘at war’ with their spouse or kids every day. Now you can imagine what would happen if a shop owner quarrels with his/her customers? The customers certainly gone off to other competitors! For these folks, I normally advised them to switch to 5 ghosts (五鬼) or if the business is larger, then the 5 legionnaires (五营兵). I was surprised of the changes after the business folks had switched to make offerings to spirits, their businesses not only recovered but expanding! I would guess that since the number of spirits/ghosts are plentiful everywhere, so they would bring in customers from all directions. Though the ghostly brothers and sisters are not as powerful as Tantric gods and goddesses, they are abundance in number and they are also more incline to help their worshippers with some food offerings as remunerations. Contrary to common belief, ghosts are no more harmful than the negative energy generated by Tantric deities. Would you choose to go to a place with negative destructive energy as if a cemetery or a place as cozy as a morning market place? If you only try to make some food offerings in front of your shop twice a month consistently for a few months, I assure you that you would see positive changes in 6 month’s time. But if you would like to perform the ritual for a longer time, then you would need appropriate ritual to control the spirits or problems may arise. It seems that Tantric rituals are not all powerful, and that the Taoist rituals can be pretty useful and helpful at times too! · The healer and patient must stand one foot in and one foot out at threshold of the main door. A straw should be used to make a transverse measurement and the patient is then asked to cough once. After that, the straw is broken and then thrown away. The healer will feel his/her nape itches but it will subside in a few days. Be careful as not to let others to stand beside. · The healer and patient should stand as above. After that the healer should take a needle to cut 3 pieces of strings transversely from the patient’s garment and then the patient is asked to cough once. Once the strings are broken, and the patient shall be cured. · There is a saying in Traditional Chinese Medicine: “Amongst all of the sickness, taking care of pain is first and foremost.” It is certainly true that once pain is relieved, the sickness is already half cured. · First, one must get a piece of iron nail and bite it with the sore tooth. After that he should use the iron nail to continuously striking on the top of a piece of copper rod and chanting non-stop: “no more pain, no more pain, I am shouting until the wind of worms retreat.” After chanting for a while, the person should nail the nail completely into the tree. Of course there are many more similar rituals. However, I cannot answer the question if the above rituals work. It is really up to each person to evaluate and decide. Magicians, Read This Book First!